This chapter points out the need for extending the conceptualization of prosociality to include development, and that of societal development to make a place for prosociality. 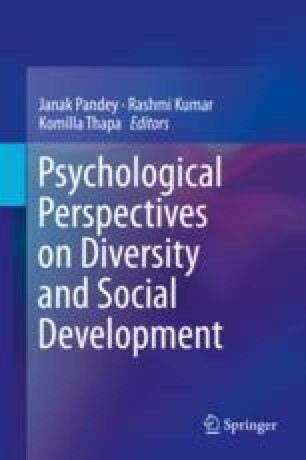 The major views related to development are summarized, and social-psychological research on prosociality is briefly reviewed. Traditional views of ‘giving’, as well as contemporary studies of prosocial behaviour in India are described. Conceptual links are then proposed between prosociality and societal development, through cultural characteristics, socialization, economic values, prosocial values and well-being. It is emphasized that economic and prosocial values can work in a complementary and not contradictory relationship, towards the goal of welfare and well-being as part of societal development. Aydinli, A., Bender, M., & Chasiotis, A. (2013). Helping and volunteering across cultures: Determinants of prosocial behavior. Online Readings in Psychology and Culture, 5(3). https://doi.org/10.9707/2307-0919.1118. Daniel, E., Bilgin, A. S., Brezina, I., Strohmeier, C. E., & Vainre, M. (2015). Values and helping behaviour: A study in four cultures. International Journal of Psychology, 50(3), 186–192. https://doi.org/10.1002/ijop.12086. Epub 2014 Jul 18. Hilbig, B. E., Glockner, A., & Zettler, I. (2014). Personality and prosocial behavior: Linking basic traits and social value orientations. Journal of Personality & Social Psychology, 107(3), 529–539. https://doi.org/10.1037/a0036074. Epub 2014 Jul 14. Klimecki, O. M, Mayer, S. V., Jusyte, A., Scheef, J., & Schonenberg, M. (2016). Empathy promotes altruistic behaviour in economic interactions. Scientific Reports, 6, 31961. www.nature.com/scientific reports/. https://doi.org/10.1038/srep31961.